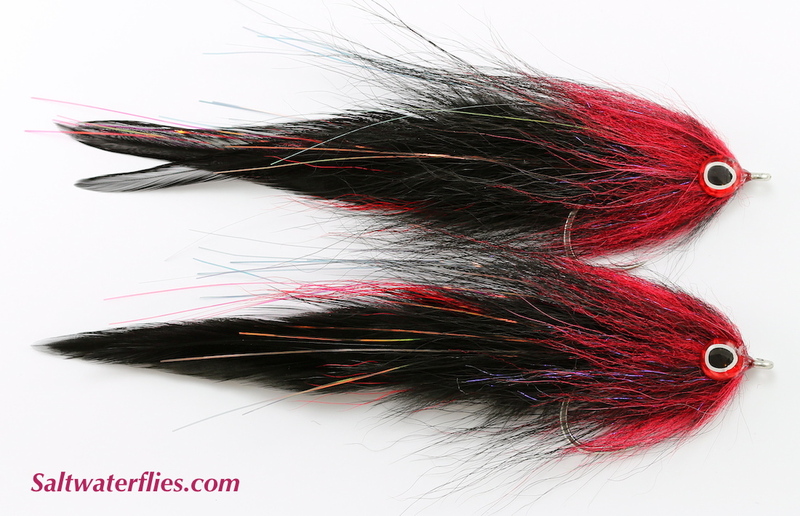 GT Slammer Fly "Red Death"
The "GT" Slammer or GT Brush Fly is a big deceiver style with large eyes - a great fly with maximum action for Giant Trevally and other monsters that prowl the wrecks, reefs and dropoffs. Excellent for a variety of inshore and offshore species, as well as big Stripers, Barracuda, Northern Pike, and more. A great choice for GTs, Jacks, and Roosters. Tied on big #6/0 hooks. 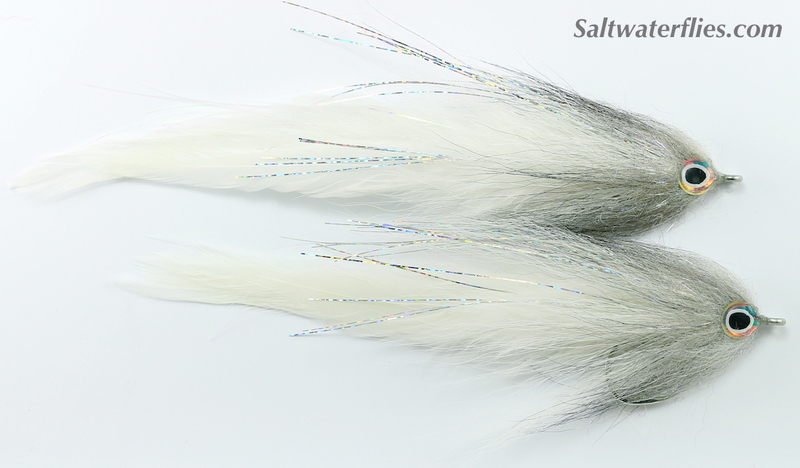 GT Slammer Fly "Gray Mullet"
These #6/0 GT Slammer flies are a bit over 6 inches long (16 cm). 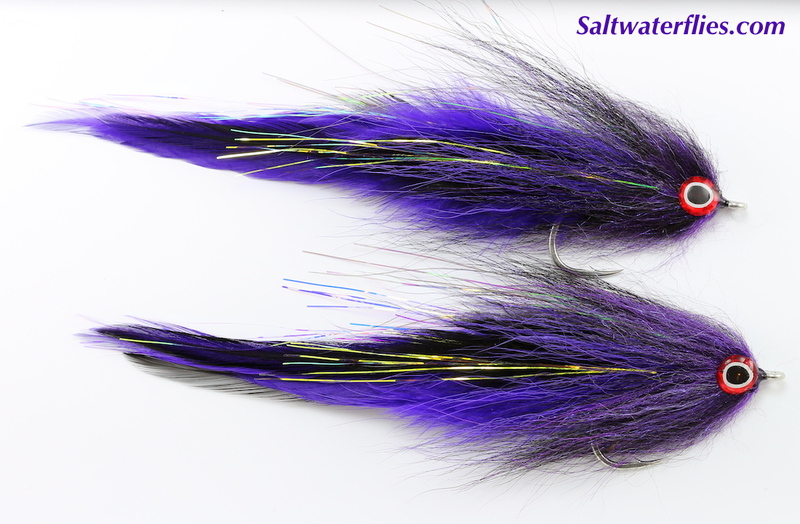 A basic materials list for tying the GT Slammer flies as pictured above includes Gamakatsu SL12 "Big Game" hooks #6/0, with saddle hackle feathers for the tail. Flash is dyed pearl Flashabou in matching colors and Flashabou Mirage Opal and/or Holographic Flashabou. Thread is flat waxed nylon in colors to match the front of the fly. Hair collar is EP "Foxy Brush" 3 inch size in desired color (grizzly red/black on the Red Death version). Eyes are "3-D" Oval Pupil style Eyes in 5/16" or 3/8" diameter size attached with Zap Gel glue. All of these materials and more are on our "Fly Tying Materials" Catalog page - see the link at the top of this page. Tied in the USA by Justin Pribanic. Note: All of the Saltwater Flies that we sell are handcrafted items - some small variations in size, color, or shape from the flies pictured here are possible. We guarantee your satisfaction with any fly purchased from us - if any fly you order from us does not meet your expectations, you may return it (unfished!) for a full refund. Fly Lines, Leaders, Tippets, Fly Boxes, Sun Gloves, T-shirts, Knot tying tools, Hook Hones, and more! We can help you to choose a fly selection for your needs.